Two of the four suicide bombers who attacked London a year ago had spent time at an al Qaeda camp to prepare themselves for a suicide attack, the deputy leader of al Qaeda claimed in new video excerpts released Friday. Al Qaeda No. 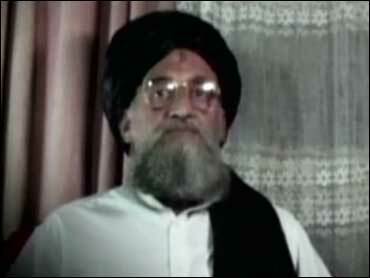 2 Ayman al-Zawahiri said that Shehzad Tanweer and Mohammad Sidique Khan had come to a base of al Qaeda. It was known that the two Muslims from north England had visited Pakistan, but al-Zawahiri's comment was the first claim that they had actually visited al Qaeda camps. "Both of them were seeking martyrdom and wished that they could carry out a martyrdom operation," al-Zawahiri said, using the Islamic euphemism for a suicide attack. It was not possible to independently verify the claim, part of a video that was posted on the Internet on the first anniversary of the July 7, 2005, bombings that killed 52 people and the four bombers. Other portions of the video, broadcast Thursday by Al-Jazeera TV, showed Tanweer warning that the attacks were only the beginning of a campaign of terror. "This tape is very interesting from the standpoint that the Metropolitan police said they had no evidence linking the bombers to al Qaeda," said Bob Ayers, a security and intelligence expert at the Chatham House think tank in London. "The coordinated timing of the tape shows these guys did not act independently and were at a minimum supported by al Qaeda — if not recruited, trained and supported by them. "It makes the police look pretty bad," Ayers said. "It means the investigation was either wrong, or they had identified links but were reluctant to reveal them."